She has been experimenting with skincare and haircare products made from humble kitchen ingredients and her friends who have used those products have been really benefited. 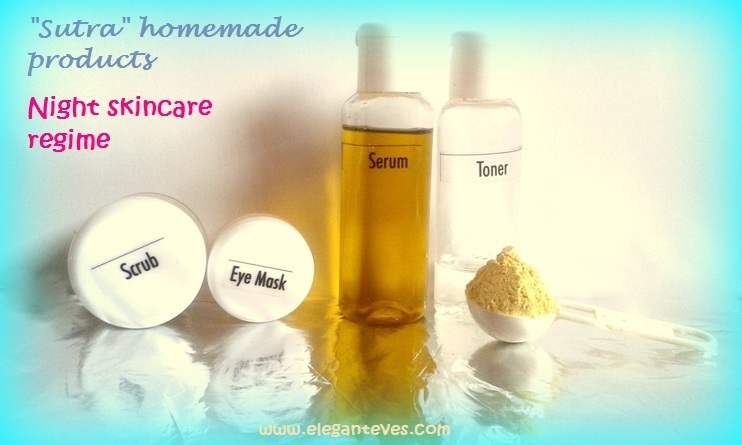 She was kind enough to include me in the circle and customized a night-time skincare regime for me considering my skin type, my lifestyle and my other specific requirements. She plans to take this up as a full-time venture in the years to come. They are all natural, organic and homemade. Packaging: Since she has not started the venture officially, there is not fancy packaging of the products. The serum and toner comes in transparent plastic bottles, the eye ream and scrub comes in similar plastic tubs and the cleanser came in a zip lock pouch (I have included just a spoonful of the product in the pictures shown here). 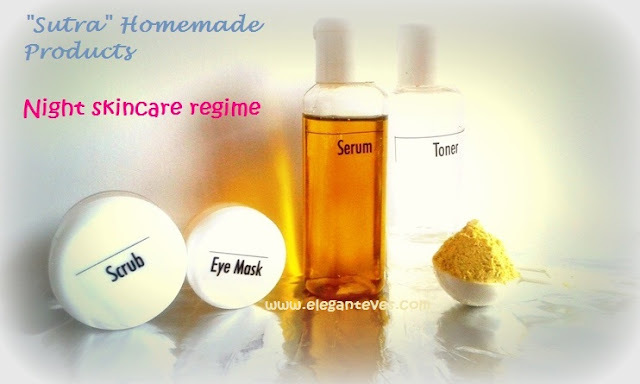 The night skin care regime consists of the first four products and is priced at Rs.1000. Additional products like the eye cream will cost you another Rs.300. 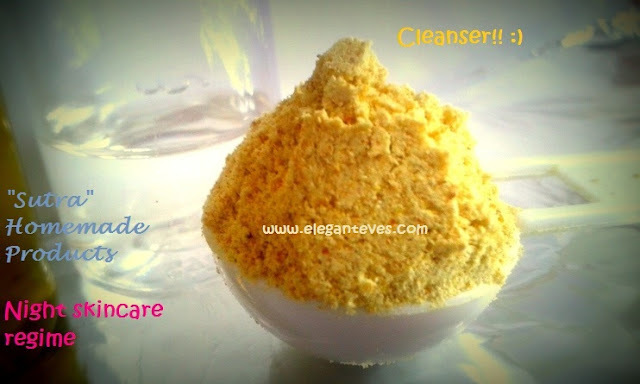 The cleanser has to be used mixed with a little water to make a paste and so is the scrub. I use the cleanser every night before bedtime and the scrub twice a week. After washing off, I take a wet cotton swab and pour some toner on it and dab all over my face and neck. Then, two-three minutes later while the skin is still moist, I take tiny drops of the oil-based serum and massage it on my face and neck. Lastly, I treat my eye contour area with this luxuriant eye cream. 1. The cleanser brilliantly cleanses away all traces of dirt, grime, oiliness around the T-zone (yes! Even my dry skin gets an oily nose sometimes) and leaves skin squeaky clean but not dry at all. I have seen chemical based products which claim “instant glow” but give “instant ghost whiteness” instead :-/ Not the case with this one :D You have to use it to believe the healthy glow! 2. The Scrub, looks very granular at the first sight and in infact so too. But the grains are soft and not harsh on skin. 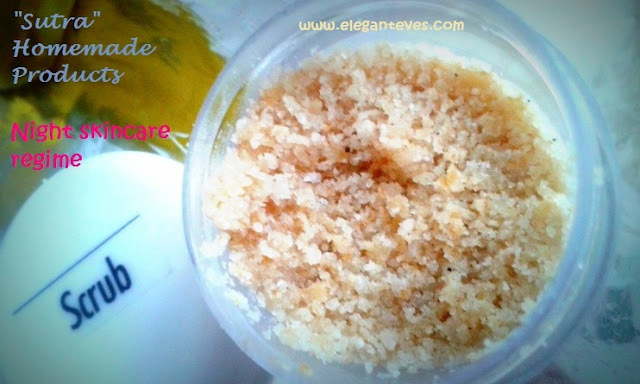 The argan oil infused in it keeps skin supple even while exfoliating the dead skin cells. It has become my favorite scrub now! ^_^ I am sooooo in love with it! 4. 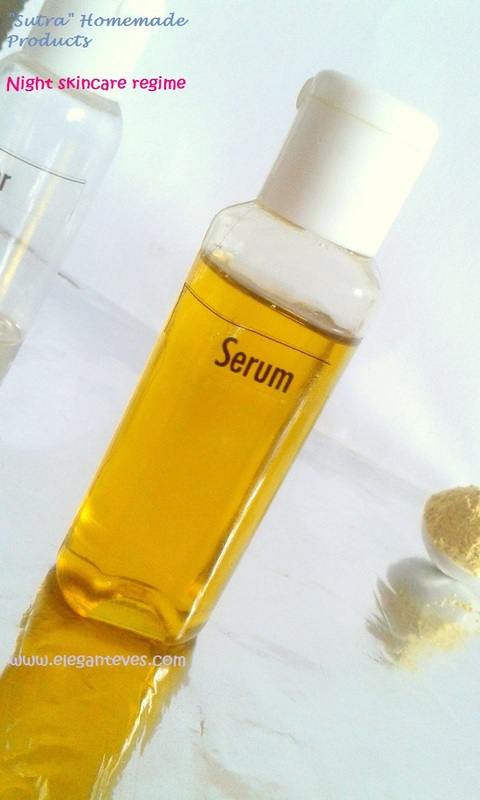 The serum is like “heaven-sent” for my normal-dry skin. Even though it is a fusion of three different kinds of oils, it is SO light on skin!! The skin just soaks it in! The key is to maintain a light hand. On a moist face (which is cleansed and toned), a single drop is enough to cover entire face and neck. 5. 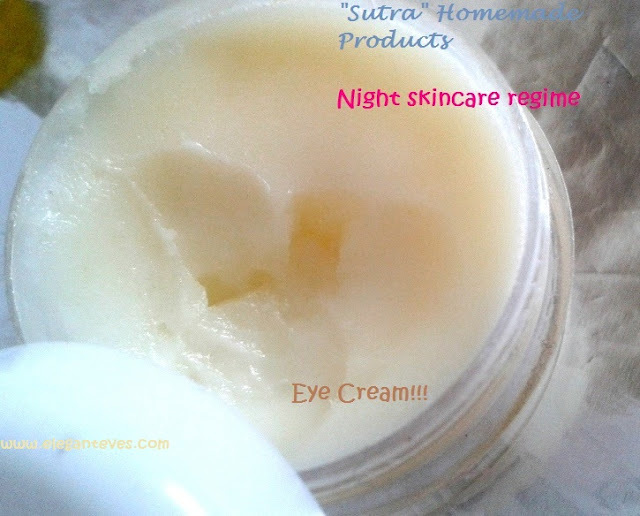 The eye-cream is rich and melts into oil when taken on fingertips. Much like how coconut oil melts with the warmth of finger tips. It is very emollient and is perfect for the nourishing massage around eyes to get rid of the fine lines and puffiness. Effect after two weeks of usage: My skin really feels brighter and nourished. Every day I wake up to fresh looking face and throughout the day the chilly AC temperature does not make my skin stretchy or flaky as it did before. All these with just two weeks of usage! I am excited to see what results I get after prolonged use! The quantities of the cleanser and serum are just perfect: They would last long. The amount of the eye cream is also good because we need to use it up within a month, so any more quantity would mean wastage. The packaging can be more professional when she starts the venture officially. The cleanser packet had burst during transit and some of the powder had spilled inside the packet L A container would be preferable. The Scrub and the eye cream can be accompanied with a small spatula for hygiene purpose. 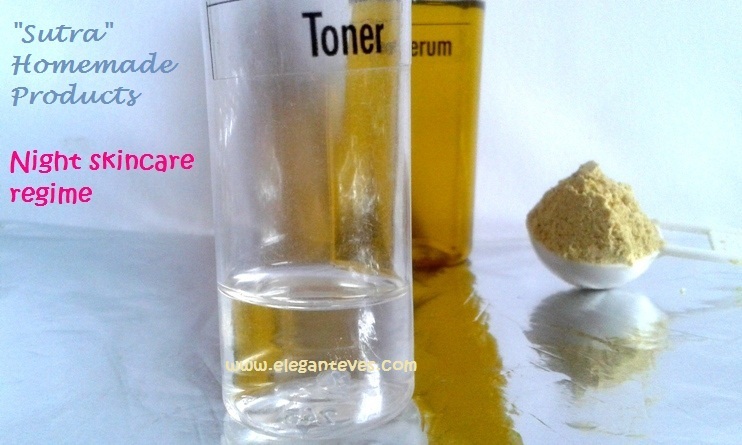 The toner should come in a larger quantity because it finishes up too soon. For 1000 bucks, I would expect the whole kit to last at least a month. I would have preferred the eye cream’s price to be included in Rs.1000. But if the toner’s quantity is increased, then the present price seems fine. Oily skinned people would find the eye cream a bit too heavy. Recommendation: I am super impressed by Deepika’s products. I would really recommend it to everyone, esp. brides-to-be as a regular skincare regime to get that ultimate glow on their special day.